Welcome to SAP-SEAL PRODUCTS, INC. a service-oriented company specializing in unique products that prevent and stop corrosion. We have been in business for over 25 years and enjoy excellent relationships with customers around the world. Visit the Sap-Seal website for more information about their products. 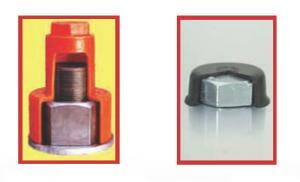 SAP-SEAL® caps allow the end user to forgo the purchase of stainless steel or galvanized nuts and bolts. SAP-SEAL® caps are available in 18 different sizes starting at ½” all the way up to 3-¾”. Any additional sizes, larger or smaller, can be custom made upon request. SAP-SEAL® caps can be made available in a variety of colors.